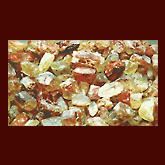 Raw sunstones owned by Desert Sun Mining and Gems. Colors range from clear to green to deep red. The sunstone is the official Oregon gemstone. When you own a business, you get used to all kinds of strange commercial offers from passersby. Talley and John Woodmark, owners of the Blue Heron and the Silver Heron galleries in Depoe Bay feel lucky they picked the one offer they did. The couple has become part-owners of the largest sunstone mine in the state. "I think it would be fun," Talley Woodmark remembers her husband saying after a man walked into the Blue Heron with a case filled with sunstones and said he had five mines they could buy in Rabbit Valley. One month later, Karen Gray, whose late-husband had owned the Ponderosa Sunstone Mine, contacted them after a deal with Janis Corporation to buy the mine for millions of dollars fell through. The Woodmarks joined together with their friend Bruce Moore and other friends and investors and bought the mine under the name Desert Sun Mining and Gems. Eighteen months later, their success is coming in waves, Talley said. "We've decided it's not going to be a hobby - it's a full-time job," she said. The sunstone is only found in Oregon, in Lake and Harney counties. It is the official state gemstone, a rare gem variety of feldspar. Colors span the spectrum from transparent to ruby, blue and green, with a range of colors often appearing in one stone. The Ponderosa Mine is known for its dark red variety of sunstone in particular. Talley said it is considered the "largest, richest mine in the world," both in terms of the richest concentration of gems and the most amount of revenue. Once they'd bought the mine, the Woodmarks and their partners began ecologically friendly mining, maintaining the area almost as a private park. "We all bring our kids and grandkids to the mine to help look for stones," Talley said. "We're planning a Native American blessing of the mine." The mining process includes pushing the loose material into a pile and then sifting it through trays and screens to find the gemstones. The stones are then sent to China to be cut under the direction of Karen Gray. They are set and sold at Woodmore and Gray Jewelers on Southwest Washington Street in Portland. Jewelry designers working with Desert Sun include Paula Crevoshay, Henry Dunay and Lynne Webb. The sunstones are also sold at the Blue Heron Gallery in Depoe Bay. Their biggest find so far is a gem they're calling "Ponderosa King," which has since been split into two stones - one 180 carats and one 120 carats. The mine's many stones are being sent all over the United States, including to such high-end stores as Tiffany and Co.
Desert Sun Mining and Gems made a stir at the gem and mineral show in Tucson, Talley said, starting with their bead sales. They used chips of sunstone that had previously been thrown away as scrap and made beads that "were the talk of the show," she said. Their booth will be in the head building next year, which usually has a waiting list of two to three years. Talley said she believes what started as a lark will end up being the most successful venture they've ever undertaken. Desert Sun will soon have a Web site, www.desertsungems.com.